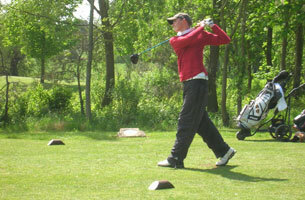 The first ever Intercollegiate Golf Tour Players championship took place at the Collingtree Golf Club, home to EuroPro Tour events and former home of the European Tour British Masters. Four players from the Bridgwater College Golf Academy qualified for the event which was played in a very strong wind and on a course that had just been set up for a Europro Tour Event the previous week. Matt Kippen showed his class by posting a first round 74 followed by 76 in the afternoon with resilient play during a spell of indecisive putting that caused him to take more shots than he is accustomed to, to finish seventh overall. In 23rd spot 9 shots further back was Warren Knight who after holing his pitch to the ninth hole from and almost impossible position for an eagle three, sadly slumped to a 45 shot inward nine for an 82 having taken a creditably 77 in the morning session. Five shots further back on 164 (rounds of 81-83) was Scott Bellinger who only hit the occasional loose shot, paying a heavy price for his trouble. Scott came into the tournament on the back of a third place finish in the Somerset Boys Championship and was looking for two good rounds this week, but alas this was not to be. Making up the fourth of the Bridgwater qualifiers from the West's allocation of ten was Alex Clapp who was going well until he had to retire hurt after injuring his back following a shot with his ball up against a tree. Bridgwater College Golf Academy Director Ron Macrow said "The squad was playing at the highest level of English College Golf and our goal was to have two top ten finishes, our boys were so close to doing that, in particular Warren. The shot he played at the ninth hole was sensational and would normally have spurred him on to greater things, unfortunately this time having laid up carefully at the short par 4, 11th hole which was guarded by a lake in the front of the green and normally would not present a problem to Warren, he pitched right in the middle of it and could see no way back from there. However having three players in the top 45 when over 200 had started the tour at Cannington back in October is no mean feat and will prove to be a positive learning experience for them."